People: A lot of lot of people. Feelings: ALev had his "birfday" party at MGru and his nice shack in Brooklyn. MGru baked a perfectly moist and tasty birthday cake called, Triple Malt Chocolate Cake, the recipe courtesy of Chowhound. She added her spin by using Horlick's malted milk powder (instead of Ovaltine or Carnation), which she got from a British grocer, Myers of Keswick. She said it was "pretty darn expensive," but it surely was worth it. She also added less butter and more powdered sugar for the frosting, so she really made the reciper her own. Sorry Chowhound. 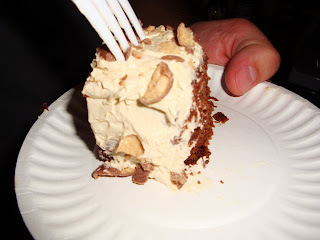 It was so good our vegan member, PeeWee had a slice of the cake (picture above as evidence), astounding everyone in the room. He also had JBH's buttery lemon poppyseed sugar cookies. He later blamed it on MGru's white sangria for his action. 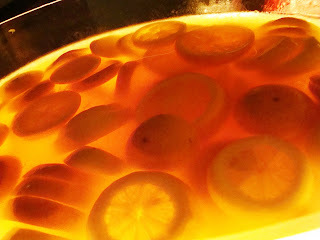 Here's the "evil" white sangria recipe that converted PeeWee to a non vegan for the night. Yeah, MGru needs to rename that sangria "Eeeevil Sangria"